I’m so glad you got to meet your Great Grandpa Bill. He was a great man! Today, it’s been one year since he passed away and I still miss him more than ever. Some of my fondest memories are of you and him in his last year of life. He anticipated your birth more than anyone, following every post and picture on Facebook. Shortly after you were born he traveled, although in poor health, from Nevada to California just to meet you. His first words were, “WOW, he looks a lot like me!” 😂 I can see his big toothy grin now, laughing at his own joke. He was a funny man, sarcastic more than anything. A few months later, in October of 2015, we visited Grandpa in Las Vegas for his 89th birthday. It was a great trip. One day, Gammy and I went shopping at an antique store and I found an old school bell. I thought it would be a funny gift for him. If he ever needed anything, he could just ring for Bonnie. Upon unwrapping his gift, he proceeded to ring that bell over and over again, while you laughed hysterically. I will never forget that moment. I’ve included the few photos I have of the two of you together in this post for your memories. Please read my post, A Heroic War Story: Remembering Grandpa Bill, for a detailed account of the Japanese submarine attack that would earn him his Purple Heart. He is my hero! For Christmas, I was gifted this beautiful, black and white photo print of my Grandpa Bill. I designed a colorful border for it using printed templates and mod podge. I am sharing this project in memory of him, on the one year anniversary of his passing. Purchase a Frame. I purchased a white frame at Michael’s. This particular frame includes a border insert that you can easily remove to accommodate a larger print. Since I would be leaving mine in, I decided to bring some color to it. Find a Template. In searching online, I uncovered this free nautical party template at www.sisterssuitcase.com. Measure Your Border & Squares. Measure your border first, then measure the squares placing marks where to cut. You won’t want any overlap on the sides, so make sure to measure precisely. Cut Squares. Cut the squares according to your measurements. I used a craft cutting board, clear measuring ruler and a rotary knife. If you don’t have these tools on hand, don’t worry. Scissors will work just fine. Design Border. Before you start gluing, take some time to design the border. I wanted mine to follow a certain pattern. I placed the squares, in pattern, on my work table, next to my border. Glue Squares. Use a paintbrush to apply a thin layer of mod podge over one entire corner of the border. Place a square on top and smooth out with your fingers to remove any bubbling, taking care over the edges. Working one by one around the frame, glue each square according to your design. I overlapped my squares slightly so there would be no gap in between. Let dry. Once you’ve glued all your squares and taken care to smooth out the edges and any bubbles, let it dry for a few hours. Apply top coat. After a few hours, apply a thin layer of mod podge over the entire piece to seal. I’d love to hear your ideas! 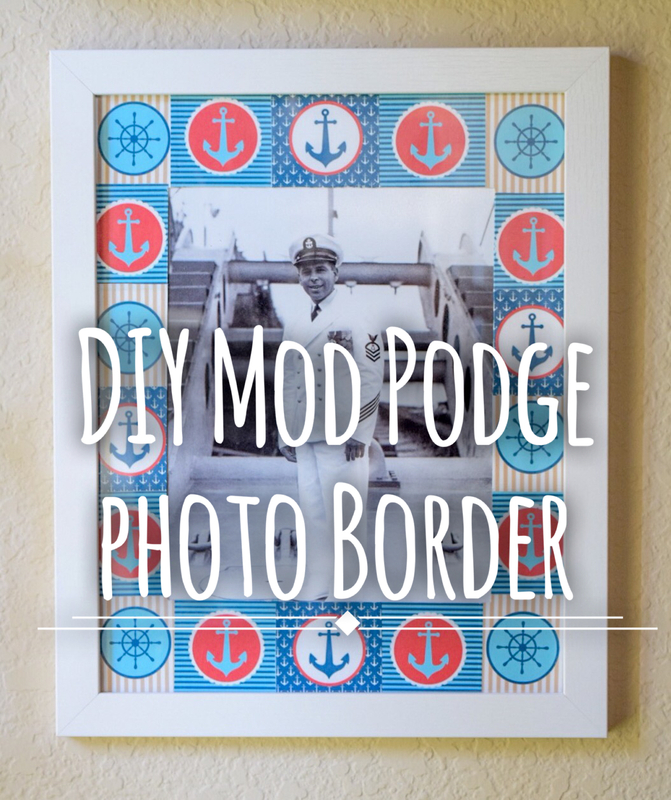 Please share with me your creative Mod Podge Projects in the comments below! P.s. Don’t forget to Subscribe & Follow! Thank you ! I appreciate the feedback! This post is so special. I see great Grandpa Bill in Dutch a lot. The photo of their first meeting touches my heart every time I see it.